What are your plans for back to school night or open house? I have often struggled with this over the years. Most families spend their time meeting their teacher, gathering forms and information and chatting with their friends. For years I was lucky to have 10 families stop in. 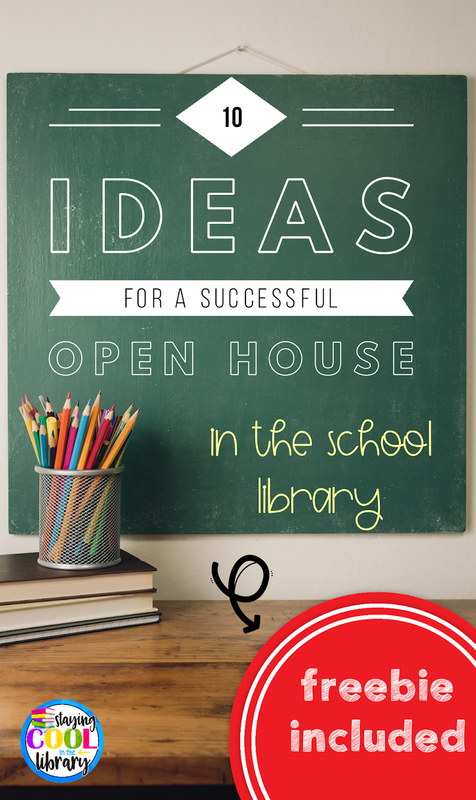 This was always discouraging because open house is the perfect time to introduce the library to parents and students and begin to showcase all the library has to offer, besides just checking out books. 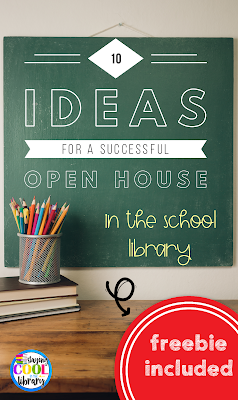 Below are 10 ideas you can implement to help you have a successful open house. Because parents receive so many papers at open house, I like to give out bookmarks instead. The bookmarks can have a variety of information on them. You can include check-out policies, an overview of some of the lessons or standards taught or a few recommended books. Put on a QR code that links to the library website or catalog. Gather up some paperback books and hold a raffle. In order to enter families have to come to the library to fill out a raffle ticket. You can announce the winners on the first day of school. You do not have to do a formal presentation, but you can have a slideshow playing. I display mine on the SmartBoard. It is centrally located so it is very easy to see when you enter the library. About me section - provide a few basic facts about yourself. Include a fun fact as well. 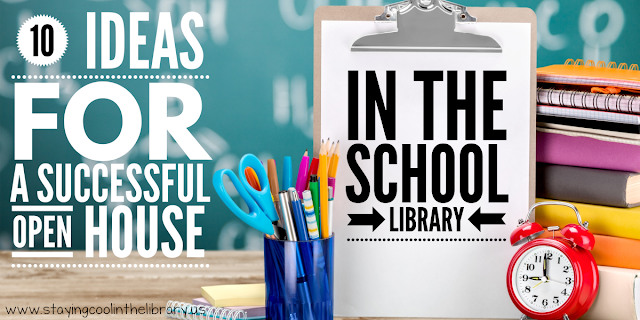 You may want to do one for your library assistant as well if you have one. Statistics - how many books are in the library, how many books are checked out each year or how many classes visit the library a week. At the end of the post read about how you can download a free, editable open house PowerPoint template. Bring out some simple makerspace materials and have families create something. Here is a free, family STEM challenge that you can try. Provide coloring pages or a simple craft for students to complete. Or you can just put out a bunch of crayons and scrap paper. Younger brothers and sisters will especially like this. Get together with the other specials teachers and do a group activity. You can do a presentation or have a booth set up in a central location. Families can stop by and collect brochures or materials you want to hand out. This way families can meet all of the specials teachers at one time. I have never done this myself (I’m not brave enough!) But I have heard from other librarians that this can be very successful. This might be a good time to try out a Follett book fair. Allow students to look for and check out library books. Encourage parents to share one of their favorite books with their child and then let the child check out that book. If you do not want to check the books out, have a stack of books available for families to look through and read together. Photo booths are a fun and creative way to not only encourage families to come into the library but to also create a lasting memory. You can collect email address and email the photos to the parents or print them out if that is an option for you. You can buy the props from Oriental Trading or make your own. There are also many free ones you can download. This website has some free back to school props you can print out. This is a great way to get to know your students reading habits and interests. You can give out paper surveys and have the students fill them out right then. Or if you have access to a set of Chromebooks or iPads you can create a Google forms survey. This way there are no papers to keep track of and the survey can be completed quickly and delivered directly to you. If you own one of my library planners there are surveys in there you can print and use. What about my free download? To download your free, editable PowerPoint template all you have to do is sign-up for my newsletter. All subscribers receive access to my free resource library. You will be able to download this template plus many other exclusive freebies. If you are already a subscriber just click here or on the resource library link at the top of any blog page.